The state of California has just issued 500 pages of regulation we must comply with under new Proposition 64 laws. Many small cannabis businesses have shut their doors because the cost of licensing and compliance is unbearable. We have been blessed with an incredible opportunity to come into full compliance with new California state regulations starting January 1, 2018. We’ve formed a partnership with Torrey Holistics, the very first dispensary to be licensed by the State of California. Yep, you read that right. Woohoo! Recreational sales will begin Monday January 1, 2018. We will be rolling out lots of changes so stay tuned as we update you every step of the way. Rest easy, we have designed a seamless experience for our Raw Family so you'll be able to continue getting the same 5 star service from the same friendly faces. We’ve got it all set up so you’ll be seamlessly guided through the process of converting over to the new state compliant online ordering experience in less than 3 minutes. You’ll need to create a new account at checkout, but it only takes a moment and it’s even easier than before. Once you create your new account, you’ll be able to finish placing your order with our new and improved, state compliant, online ordering system. We plan to keep you fully informed throughout the whole shift. Below, you'll find a Frequently Asked Questions section that goes over all the changes we have at this time. Thanks in advance for your patience and understanding while we navigate these new changes. If you have any questions, just reach out to us, we’re happy to help. Click below to be guided through the improved experience. The cannabis industry in California has operated without regulation since 1996 under Proposition 215. Now, with the passing of Proposition 64, California is moving from no regulation to now over 500 pages of regulation. Many changes must take place in order to comply with these regulations. The good news is that we are now fully licensed by the City of San Diego and the State of California. Thanks for your understanding during this period where we will be making changes to come into compliance. We’re switching to a new state compliant ordering system. We’ve got it all set up so that on Monday morning, January 1st, you’ll be seamlessly guided through the process of converting over to the new compliant system in less than 3 minutes. You can shop and place your orders online just like before. You’ll need to create a new account but it only takes a moment and it’s even easier than before. If you have any issues, just reach out to us and we will fix them immediately. Will I still receive a free item with every delivery? Unfortunately, the new regulations strictly state no free cannabis products shall be given out or our license will be revoked. However, what we will be implementing is a customer loyalty program. For each purchase you make, you’ll earn customer loyalty points which you can redeem for discounted products right within our online store. Woohoo! Will my deliveries still arrive in under 1 hour? We hope so. New regulations limit the amount of cannabis products that we can carry on board in our delivery cars. This will make it difficult to keep a wide variety of products available for rapid delivery. We’re thinking creatively and working to develop software that will help us still provide a wide selection of products for delivery in under 1 hour. Please be patient and be flexible during the first few weeks of January while we work to provide the same level of service and remain compliant with regulations. Will your service hours be the same? We will be offering an expanded set of hours beginning January 1, 2018. We’ll be open from 9am to 9pm, 7 days a week. Will all of the same products be available? New regulations will sadly make many existing products in the cannabis market non-compliant. This is extremely frustrating for many cannabis brands who’ve built their entire business on these products which will now be forced out of the cannabis industry all together. The only Dr. Raw products that will remain available in 2018 are our coconut oil tinctures in the white bottles and the hard candies. All other products will not be available due to regulation. Sadly, our wildly popular 500mg brownie will be a thing of the past. We are incredibly sad about this. California regulations now say edibles can only be a maximum of 100mg per package and 10mg per serving. The good news is you will see many fantastic, new products come to market this year. Prepare to experiment and provide your feedback as we work to curate a brand new selection of offerings. We’ll be taking your feedback very seriously so if you have something to say, please speak up. Will I still get text updates with arrival times and driver tracking? Will the taxes on cannabis purchases change? Oh yes, and we had nothing to do with this, promise. The state of California has implemented a 15% excise tax on all cannabis purchases that will be built in to the retail price of products. Additionally, each city will tack on its own tax. The city of San Diego tax will start at 5% and likely increase each year moving forward. Then, state sales tax will be applied which is 8% here in San Diego. These are the customer facing tax changes that will take place. Behind the scenes, in the supply chain, there will be many taxes applied on growers, manufacturers, distributors and retailers. Prepare for price changes at the register stemming from all these new taxes that will be levied starting January 1, 2018. If you obtain a state approved medical marijuana ID card, you’ll be able to save yourself the 8% state sales tax. All other taxes will still apply. A standard doctor’s recommendation card will not allow you to receive the tax break. You will need to go to the county department of health and obtain the California State Medical Marijuana ID Card in order to receive the tax savings. Will I still call the same phone number? We will be switching over to a new phone number sometime in late January but for now you can still call us at 619-316-5375. Does my order still come with a 100% satisfaction guarantee? You bet! If you’re not satisfied, just reach out to us. We want to make each and every experience a positive experience. May I come into the physical dispensary instead of ordering online? Yes, very soon! We are working quickly to prepare a great storefront experience for our Raw Family. We will be ready to invite you over to our physical dispensary in just about 2 weeks. We wish we could have it ready sooner, but there are so many regulations we must comply with first. You’ll be able to come in to the store and see all the smiling faces of the Raw Collective working hard. 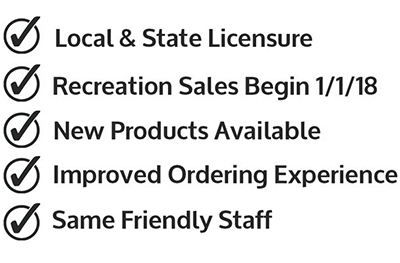 You have been warned though, wait times are expected to be very long due to the massive influx of customers that will be shopping in the new recreational market. Ordering by delivery will likely be much faster and less hassle. Certainly stop by anytime you want to say hi and give us a big hug. We plan to host a welcome kick off event in late January and invite the whole Raw family. Stay tuned for details.